In the morning, as usual we woke up late. Having brunch I should say while watching the Tour the Ski on TV. Our day is continue with some outdoor activities, such as walking under the snow which falling nicely and taking pictures at the same time. I put on my list that I will do exercise minimal one hour per day, and because all group training are fully book, so I decided to spent time out with P. It was brilliant weather to have a walk, not to cold and not to warm either, exactly at zero degree. 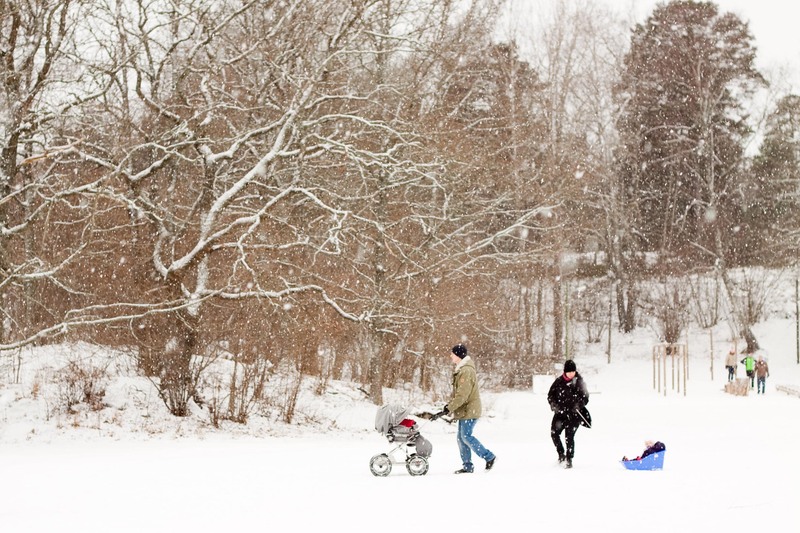 I saw many parents together with their kids try the slope near the lake in Nacka Nature Reserve, what a lovely view every where we went. My picture above is one of many favorite for today 🙂 and even many babies were out there. I never been to this park and trust me… I’ll come again! Hopefully the snow will stay for quite sometimes. It was snowy when we walk on the frozen lake. To be able to walk again one the ice is a wish that everyone in Sweden has. Like today, a view of people ice skating with smile on their face is a wonderful experience to see. I promise myself to learn how to skate one day… as my blog title, one step at the time. Time flies and I have long list to do, so… will come back tomorrow with another story, another things to achieve. Have a great evening folks!